CircuitWorks® Flux Pens are designed specifically to apply each type of flux with precision control. 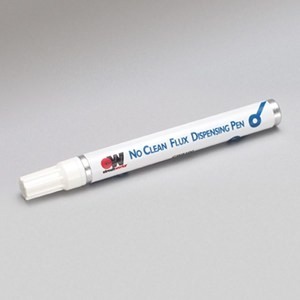 The No Clean Flux Pen precisely applies a patented noncorrosive, halide-free, organic low solid flux. This flux meets Bellcore TR-NWT-000078 and IPC SF-818 for surface insulation resistance. CircuitWorks® Flux Dispensing Pens provide controlled and exact applications that are generally compatible with most materials in the electronics industry. Dispense flux on printed circuit boards, heat sinks, chip carriers, switches, sockets and much more. CircuitWorks® Flux Dispensing Pens are fast drying, completely portable and have minimal excess flux waste.